After minimal Hurricane Kyle lashed eastern Maine, southern New Brunswick, and western Nova Scotia, Subtropical Storm Laura developed early Monday morning in the north-central Atlantic, about 1000 miles west of the Azores. Maximum winds were 60 mph, and some strengthening was expected, but the storm never exceeded that intensity. Laura became a tropical storm on Tuesday and gradually weakened as it continued moving generally northward over colder waters. The storm lost its tropical characteristics and weakened further yesterday morning. Meanwhile, the Tropical Meteorology Project at Colorado State University released their updated hurricane season forecast yesterday. They expect an active October, with 3 named storms, 2 of which would be hurricanes, with 1 of them major (Category 3 or higher). So far this season, there have been a total of 12 named storms, including 6 hurricanes, 3 of which were major. Hurricane Kyle has lost its tropical characteristics as it skirted western Nova Scotia approaching New Brunswick. 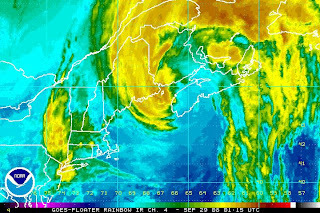 At 10 pm EDT, Kyle made landfall just north of Yarmouth, Nova Scotia as a minimal Category 1 hurricane. A hurricane force wind gust was reported at Baccaro Point, Nova Scotia, and a higher gust was reported from a Coast Guard ship offshore. Maximum winds are still estimated at 70 mph, and tropical storm winds extend as much as 240 miles from the center. At 11 pm, the center of the storm was located 60 miles south of St. John, New Brunswick, moving north at 26 mph. Tropical storm force winds are still likely over parts of southern Nova Scotia and southeastern New Brunswick the rest of tonight. 5 pm Update: Hurricane Kyle is now a minimal hurricane with winds up to 75 mph as it approaches landfall on the coast of Nova Scotia within the next 6 hours. The storm is moving north northeast from a position 140 miles south southwest of the southern tip of Nova Scotia. Kyle is in the process of losing its tropical characteristics. The Hurricane Warning for southwestern Nova Scotia remains in effect. 2 pm Update: Hurricane Kyle remains a Category 1 storm with maximum winds of 80 mph. It continues to move north northeast toward Nova Scotia and New Brunswick. Hurricane Kyle strengthened slightly overnight to maximum winds of 80 mph. Its track has shifted toward the north northeast at 24 mph, heading toward a landfall on the Nova Scotia and/or New Brunswick coasts. 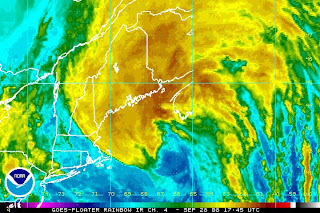 The cold waters of the Gulf of Maine will rob the storm of some of its strength before landfall, and it will be transitioning to a non-tropical cyclone. Rainfall amounts of 2 to 4 inches are likely with some totals over 6 inches possible over extreme eastern New England, New Brunswick, Nova Scotia, and Prince Edward Island. Radar estimates this morning showed rainfall totals as high as 20 inches over the Atlantic east of Nantucket.